Paul Manafort listens to Rick Gates testifying on Tuesday. This courtroom sketch depicts Gates (right) answering questions by prosecutor Greg Andres as he testifies in Manafort's trial. Manafort's lawyers have seized on that. "This jury is just supposed to believe you after all the lies that you've told and the fraud you've committed?" asked Manafort defense attorney Kevin Downing. Part of that agreement included admitting to having lied to investigators working with the office of Justice Department special counsel Robert Mueller. Downing seized on that admission, and the fact that Gates is probably avoiding decades of potential prison time by working with investigators. He questioned Gates' trustworthiness and his motivations for working with prosecutors. Downing also broached an extramarital affair that Gates carried on 10 years ago — a "secret life," as Downing put it — in an apparent effort to taint his reliability as a witness. "I acknowledge I had a period of time where I had another relationship," Gates said. Defense attorneys not only want to damage Gates' trustworthiness but buttress their narrative that Manafort did not keep a close eye on his finances. If there were problems with his financial paperwork, the defense lawyers have argued, it was because Manafort made honest mistakes or he was a victim of what they've called Gates' perfidy. "Rick Gates had his hand in the cookie jar, and he couldn't take the risk that his boss might find out," Zehnle said. Prosecutors have sought to bolster their case that Manafort was the mastermind by showing the jury email chains in which he is directly involved with discussing the alleged financial crimes. The government's lawyers also have asked other witnesses questions intended to draw out that theme. "In most instances, it was clear that Mr. Manafort knew what was going on," said Cindy Laporta, a tax accountant for Manafort who also dealt with Gates. She testified on Monday. At one point, Gates said Manafort was "very good at knowing where the money was and where it was spent." The judge interjected to say that he thought Manafort couldn't have been that good if he didn't notice the money Gates stole. As Manafort's former business partner and right-hand man, Gates testified in granular detail about how the two men used bank accounts in Cyprus and a middleman lawyer nicknamed "Dr. K" to hide and receive payments from Ukrainian oligarchs. "I believe [Manafort] understood his name would not be represented, nor would mine," Gates said. When asked by prosecutor Greg Andres who controlled the overseas accounts, Gates responded: "[Manafort] always had control." "And whose money was in those accounts?" Andres followed. "Mr. Manafort's money," Gates said. Jurors were shown an email in which Manafort responded "WTF" when confronted with how much he would have to pay in taxes if he did not make efforts to adjust his taxable income one year. "Why can't you say embezzlement?" Gates clearly had a simpler time answering questions from prosecutor Andres than he did those from Downing. At one point, Gates characterized his taking money from Manafort via the expense reports as "an unauthorized transaction." "Why can't you say embezzlement?" Downing asked. "It was embezzlement from Mr. Manafort," said Gates. Downing, at another point, called Gates out for having a more difficult time remembering things when he was doing the questioning compared with when Gates was being questioned by the government's lawyers. Within the first hour of his testimony, Gates said explicitly that he broke the law with Manafort, including by providing false and doctored documents to banks in an effort to inflate Manafort's income to qualify him for loans. Gates also said he lied to accountants working on Manafort's taxes, to conceal foreign bank accounts that prosecutors say Manafort used to hide tens of millions of dollars from the IRS. "At Mr. Manafort's request, at different points in the year, we did not disclose the foreign bank accounts," Gates said. When his consulting work dried up after the change of power in Ukraine, prosecutors say, Manafort turned to loans to maintain his lifestyle. The government's lawyers say he qualified for them by lying to lenders. Manafort served as Donald Trump's campaign chairman for a time in 2016 and Gates was his deputy in that role, too. That chapter, for the first time, was touched on in court on Tuesday. After Trump's election, Gates went to work for the then-president-elect's inauguration committee. Gates said Tuesday that even though Manafort had resigned his post within the campaign months prior, Manafort reached out in November 2016 about trying to push for Federal Savings Bank CEO Stephen Calk to be nominated as secretary of the Army. Defense attorneys pointed out long before the trial began that Manafort has not been charged with conspiring with the Russians who attacked the 2016 election — the main focus of Mueller's investigation. Bill Coffield, a D.C.-area attorney who specializes in white-collar law, says prosecutors needed to use Gates' testimony to flesh out the narrative of Manafort's alleged crimes, but they also must continue to back it up with documents and other witnesses who dealt with Manafort's finances. "What the prosecution needs to do is put some meat on the bones," Coffield told NPR's Morning Edition. "They've got somebody whose credibility — talking about Rick Gates here — they've got somebody whose credibility has been severely wounded." On Monday, he clashed with prosecutors over the pace they were taking, as they sought to detail Gates' travel history to and from Ukraine. "Let's get to the heart of the matter," Ellis interrupted. "Judge, we've been at the heart ..." Andres said. "Just listen to me!" Ellis responded. Later in the day, Andres apologized and Ellis accepted, saying: "I'm not concerned about that at all. I remember trying cases." When they tried to illustrate Manafort's wealth, Ellis stopped them, saying it wasn't a crime to be rich. When they tried to talk about the Ukrainian oligarchs who paid Manafort, he said it "wasn't the American way" to bias a jury against a defendant based upon the people he chooses to surround himself with. The trial of former Trump campaign chairman Paul Manafort is steamrolling ahead today. Rick Gates took the stand for a second straight day to testify against Manafort, his one-time boss and mentor. Both men are tangled up in legal trouble over complicated financial arrangements that prosecutors allege allowed Manafort to commit bank and tax fraud. Gates has already described on the witness stand how he helped Manafort hide income to avoid paying millions in taxes. NPR's national justice correspondent Carrie Johnson has again spent the day listening to testimony in that federal courtroom in Alexandria, Va. And she joins us now. Hey, Carrie. 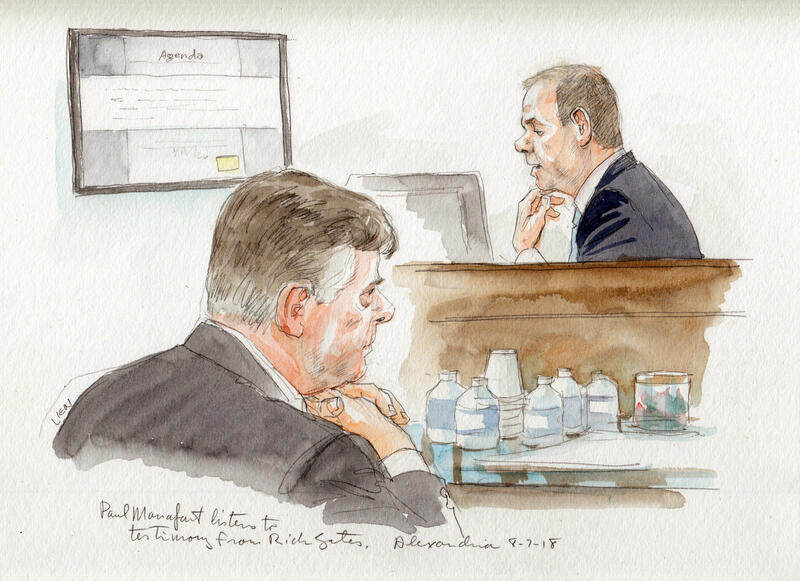 CHANG: So all right, Rick Gates has been long touted now as the prosecution's star witness against Manafort, and Manafort's lawyers got a chance to cross-examine him today, which everyone has been expecting to be the high drama of the trial. Was it? What happened? JOHNSON: Yeah. Paul Manafort's defense lawyer ran Rick Gates through a long list of wrongdoing - embezzling hundreds of thousands of dollars from Manafort by padding expense accounts, fraud with a different business partner and living a secret life, what Manafort's lawyer said was an affair with a woman in London 10 years ago while Rick Gates was married. Manafort's defense team hammered on Gates' lie to the Office of Special Counsel, these prosecutors, after he'd already been charged with other crimes. And it took Rick Gates a while on the witness stand to say he lied to the FBI even though he pleaded guilty to that charge. Then Manafort's defense lawyer, Kevin Downing, said you seem to have such a perfect recollection on direct examination by these prosecutors. You're having such a hard time now. Why is that? Kind of an important moment in the cross-examination. CHANG: And how damaging was this testimony from Gates then for prosecutors? JOHNSON: Well, the jury took close - took notes, paid close attention to this attack on Rick Gates. Several jurors seemed to have a negative reaction to him. And at one point, when Manafort's lawyer asked Rick Gates whether he saved himself from potentially hundreds of years in prison by pleading guilty, Gates made a joke. The audience in the courtroom laughed, but it was not clear that it was funny to the jury or to prosecutors. JOHNSON: Now, Rick Gates went on to say he was living behind - beyond his means, and he regrets it, that he made a mistake. Finally, he came out and said, I'm here to tell the truth and take responsibility. Mr. Manafort had the same path. I'm trying to change. Ailsa, really the question is whether the government has presented enough corroborating evidence like emails and accounting papers to back up the gist of what Rick Gates is saying about his former business partner, Paul Manafort. CHANG: What about this morning when Gates was on direct examination? I mean, did we learn any more about the bank and tax fraud scheme Gates says he and Manafort were both involved in? JOHNSON: Well, we heard evidence that Paul Manafort did ask for financial documents, that he sent emails, so he wasn't delegating all of that financial business to Rick Gates. We also heard both men were in touch even after Manafort left the Trump campaign in 2016. Remember; Rick Gates stayed on. He took a job with the inaugural committee, and Manafort was emailing Gates to try to get a job for a banker who lent Paul Manafort money and to get that banker some tickets to the inauguration ceremonies themselves. 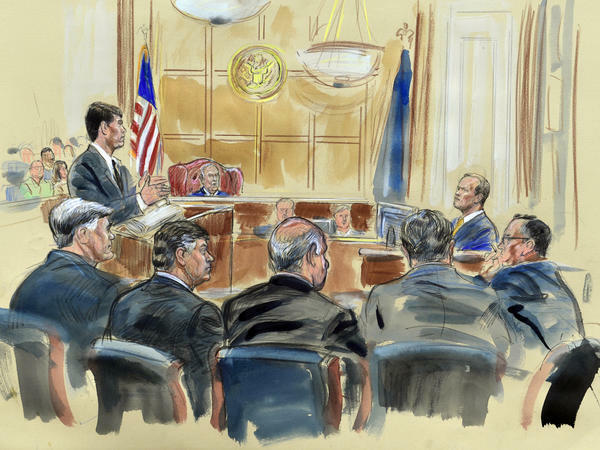 There was some question raised in cross-examination by Manafort's defense lawyer about whether Gates had padded expenses during the inauguration run-up. But that question was never answered. We don't know the answer to that. CHANG: OK. It sounded like quite a full day. What can we expect tomorrow for this trial? JOHNSON: Well, yeah, tomorrow, more Rick Gates - another hour or so of cross-examination. Then the government is going to try to rehabilitate their key witness. Then we're likely to hear from an FBI agent, maybe some more lenders. That may close out the government's case this week. CHANG: All right. That's NPR's national justice correspondent, Carrie Johnson. Thank you, Carrie.